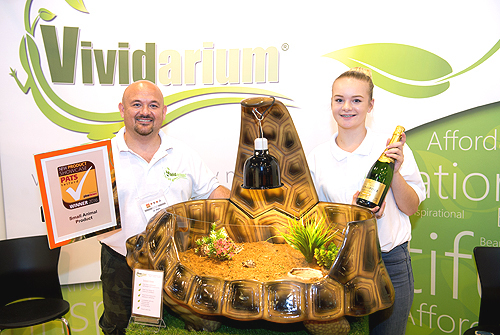 Vividarium; an East Yorkshire based pet product firm, had reason to celebrate last weekend when their innovative new tortoise enclosure took the coveted “Best New Small-Animal Product Award” at the PATS 2016 International Pet Trade Show, which was being held in Telford, Shropshire. The two day event saw over 200 companies showcase their new products to thousands of potential retailers and stockists who had flown in from all over the World to witness some truly incredible innovations. The exhibits were also judged by a panel of industry-leading experts who gave their critique, opinions, and advice to all who had entered their products into the show. The range of newly invented, or newly improved upon, pet-related goods on display was simply incredible, with everything from new flea tablet formulas through to flashing dog leads being offered to prospective customers. However, it was the very cleverly designed Tortoise Home, manufactured by Vividarium, which stole the hearts and minds of most, to be crowned “2016’s Best Product”! 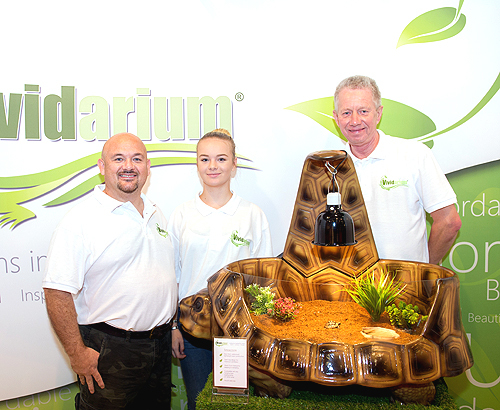 The Tortoise habitat, which is moulded from lightweight polyresin, is designed to look exactly like the creatures it’s been manufactured to house – namely, a tortoise! The 3ft long enclosure, complete with head, legs, shell, and even a tail, has been expertly conceived with both aesthetics and the welfare of it’s inhabitants at the very forefront of its design. 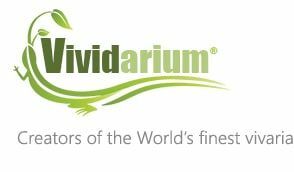 Les White, Chairman of Vividarium explained “We wanted to create a habitat which the public would be proud to have as a main focal point in their homes. So the aesthetics had to be just right. Every wrinkle of its neck, or scale on its legs had to be designed and finished with superb quality and in exquisite detail. However, primarily its main objective is obviously to serve its purpose as a healthy and safe environment for the animals which it houses, and we didn’t want to settle for mediocre in this respect either. So, the enclosure boasts industry-leading features such as a circular internal design which helps to prevent tortoises from falling on their backs when “chimneying” up right angled walls as you obviously get with all traditional rectangular enclosures. We’ve added a built-in hide area within the head of the design, which tortoises can retreat to when they feel the need, reducing stress levels. It’s lightweight and waterproof construction enables it to be easily cleaned out and disinfected and it will never rot, unlike its wooden counterparts. Its compatible with all the commercially available hanging basking lamps or clamp lamps and it even features a neatly built-in cable-tidy too. All-in-all we think we’ve pretty much nailed exactly what we set out to do.